Nowadays, page speed is one of the most important ranking factors that search engines like Google and Bing take into account. When your website/blog is slower, this has a big influence on your chances to take a high ranking position. Page speed is a sum of several things. And when it comes to speed, never settle for less. Choose a hosting party with a good reputation for speed, consider using a CDN, reduce your images, do not use redirects unless you have to, make sure your site is responsive. 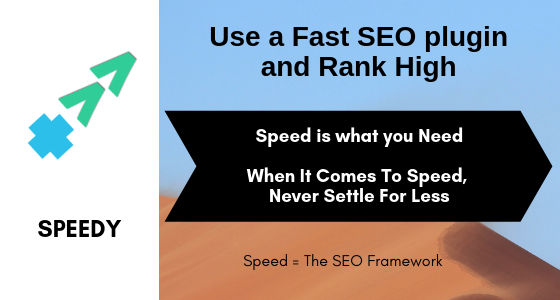 But also use a fast, lightweight SEO plug-in, such as The SEO Framework, which will greatly improve your page speed. All this makes The SEO Framework a must-have SEO plugin for bloggers and text writers.